Heat oven to 375°F. Separate dough into 8 triangles; pat out each triangle slightly. Place 3 slices pepperoni, slightly overlapping, on centre of each triangle. Top each with about 1 tablespoon cheese. Roll up, starting at shortest side of triangle and rolling to opposite point. On ungreased baking sheet, place rolls, point sides down. Bake 10 to 14 minutes or until golden brown. Remove from baking sheet. 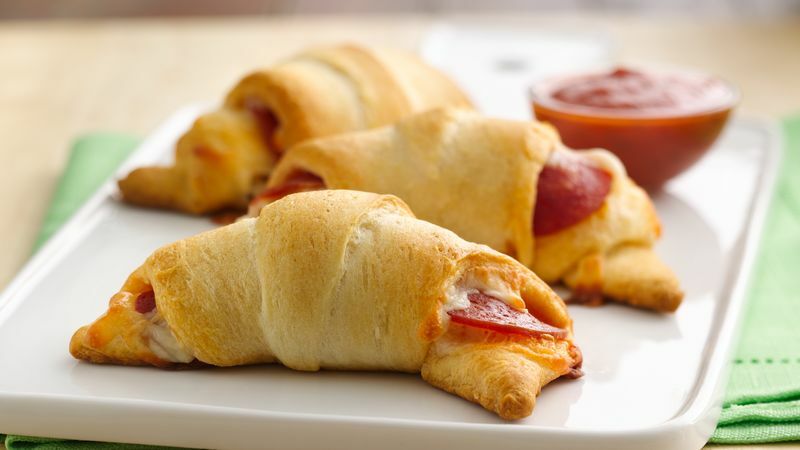 Serve warm crescents with warm sauce for dipping. Substitution The recipe calls for sliced pepperoni, but chopped works just as well. Do-Ahead Shape these crescents up to 2 hours ahead; cover and refrigerate. Bake them just before serving. Serve-With For an appealing lunch, serve a couple of these tasty rolls with a big green salad.